My niece loves the book “Rainbow Fish,” so for her first birthday, my sister and I made her a Rainbow Fish cake. 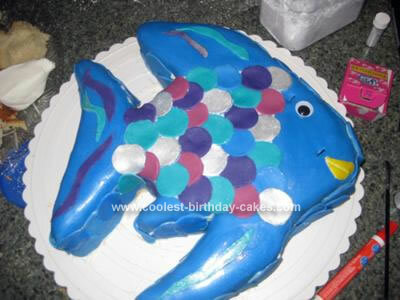 We made a 16″ round white cake from a regular box mix then cut the shape of a Rainbow Fish with an electric knife. We tinted fondant to cover it and cut out tinted fondant circles for the scales. The only thing we didn’t make was the eye; for this we used a googly eye from the craft department. We were really excited with how it turned out.